Live music from Eve Ferret and John Gillman talks about his bus ticket collection. Eve Ferret was talking about her cabaret 'Pimlico Pâté' at St James Theatre on London Live News. Fitness advice from personal trainer William Falade, cabaret star Eve Ferret chats about her new show and Jo Parsons and Ben Woods talk about 'Thrill Me' at the Greenwich Theatre. 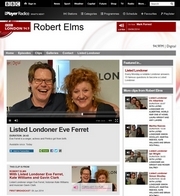 With Listed Londoner Eve Ferret, Kate Williams and Gavin Clark (First broadcast: Monday 09 June 2014). April 2014 - GREAT NEWS! 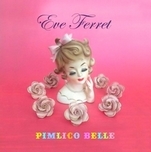 Eve Ferret has released her first ever album named DOOLALLY. It can be bought at Eve's shows or through PayPal using your PayPal account or Credit Card via the ADD TO CART link below. The digital album download will be available very soon!